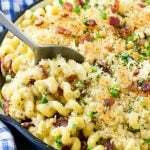 This jalapeno popper mac and cheese is a creamy and spicy blend with four cheeses, bacon, jalapenos and a crispy topping. 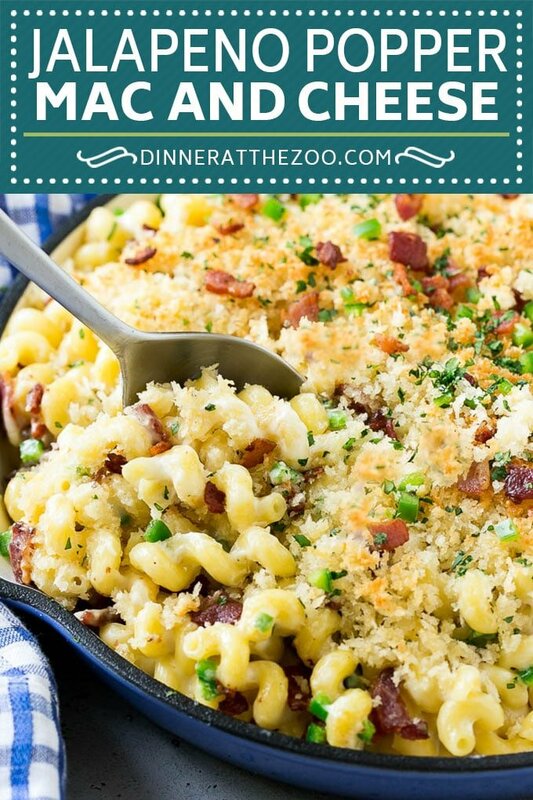 The ultimate macaroni and cheese recipe! If you love jalapeno poppers, you’ll adore this unique take on macaroni and cheese. It’s got all the flavors of the classic appetizer mixed with creamy, cheesy pasta. 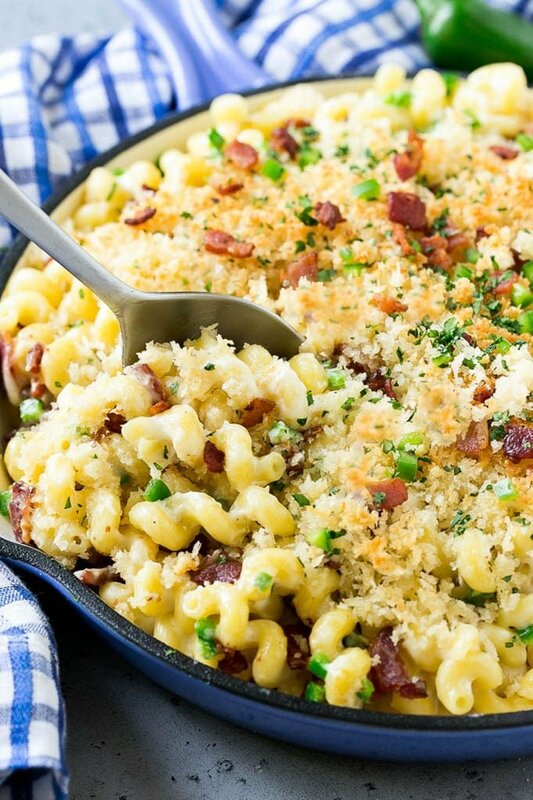 Mac and cheese is one of those classic comfort foods that people always adore. I love mixing up the traditional dish from time to time by adding bold flavors like in this jalapeno popper mac and cheese. I’ve simply added in some spice and a crispy topping to take things up a notch, while still maintaining all the creamy and cheesy goodness. 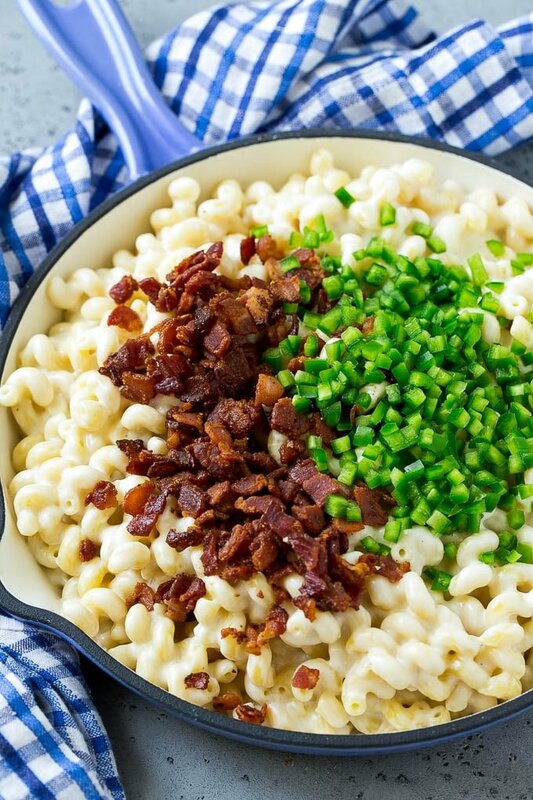 HOW DO YOU MAKE JALAPENO POPPER MAC AND CHEESE? 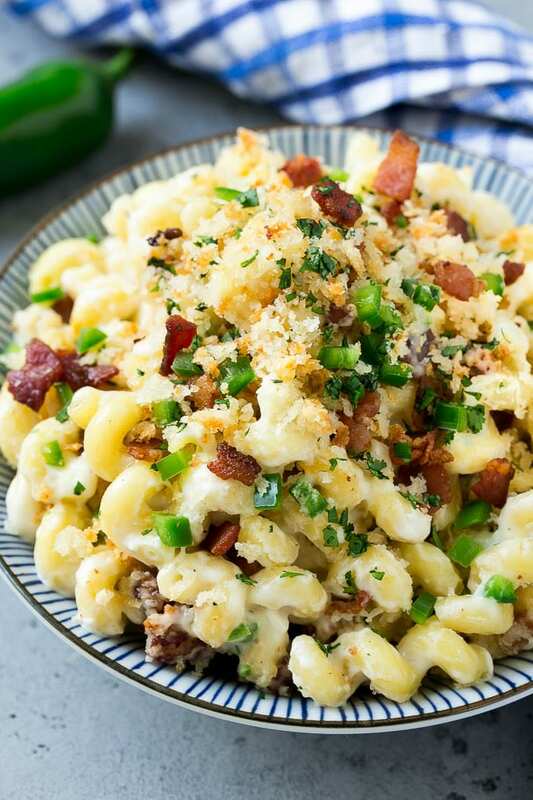 This spicy mac and cheese is made with a creamy blend of of four cheeses, bacon, jalapenos, and a perfectly crispy topping. The pasta is simmered in milk before the cheeses are stirred in to make the base of this dish. A generous amount of bacon and diced jalapeno get stirred in, and the finishing touch is the buttery panko breadcrumbs and a sprinkling of fresh cilantro. 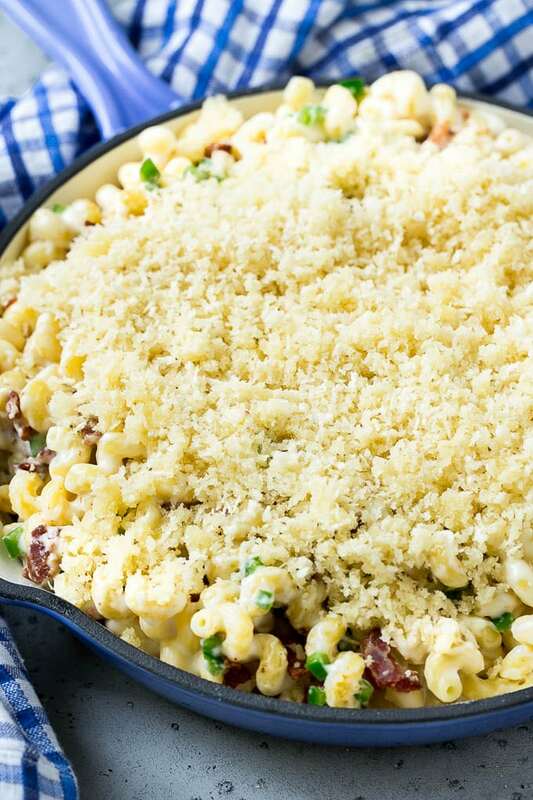 When it comes to making this jalapeno mac and cheese, any combination of cheeses can be used. I typically use a combination of cream cheese, white cheddar, and white American for an ultra creamy macaroni. You can also use Monterey jack cheese, or if you like your mac extra spicy, try pepper jack cheese! White american cheese can be found at the deli counter in most grocery stores. You can use fresh jalapenos or jarred pickled jalapenos for this spicy mac and cheese. If you prefer a mild dish, remove the ribs and seeds from the peppers before dicing them up. Add your breadcrumb and parmesan topping, then bake until golden brown. WHAT IS THE MOST POPULAR CHEESE TO USE WITH MAC AND CHEESE? Everyone has a different preference when it comes to the cheese they like to use in their mac and cheese dishes. However, there are a few cheeses that are more common than others with this comfort food dish. The top five cheeses used in mac and cheese are parmesan, sharp cheddar, white cheddar, smoked gouda, and fontina. WHAT IS THE BEST PASTA TO USE IN MAC AND CHEESE? Just about any type of short pasta will do when it comes to the classic mac and cheese dish. However, elbow macaroni has long been one of the most popular pasta choices. Shells and cavatappi pasta are also both popular choices. 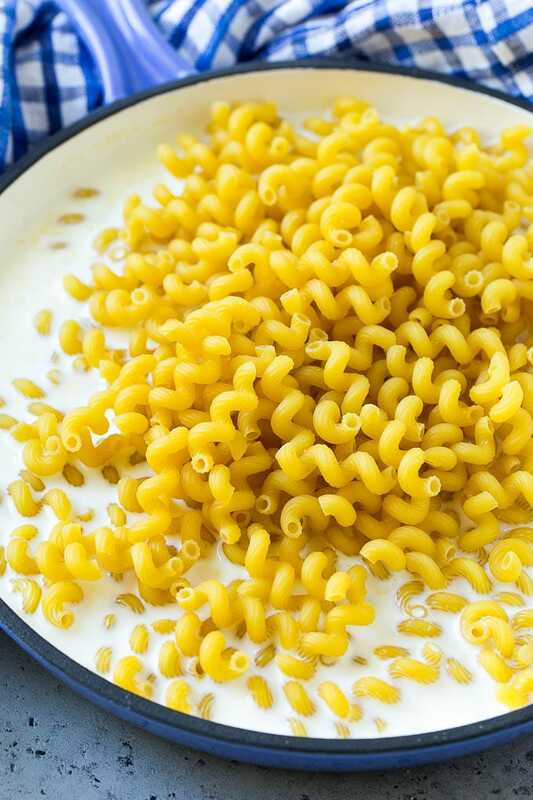 I’ve used cavatappi pasta here because I love how the sauce clings to those long spirals. This jalapeno popper mac and cheese was one of the easiest dishes I’ve made and it actually ended up being dinner and not just a side dish. Although it works great as a side dish, it’s hearty enough that it could definitely be the main meal. We’ve already added this cheesy dish to our menu for next week’s dinner choices. Melt the butter in a large pot over medium heat. Add the flour, then whisk until combined, about 30 seconds. Pour in the water and whisk until smooth and just thickened. Add the milk and whisk until combined. Stir in the macaroni, salt, garlic powder, onion powder and pepper, then bring the mixture to a simmer. Cook for 8-10 minutes, stirring occasionally, until pasta is done. Turn the heat to low, then stir in the cheddar, American and cream cheeses. Keep stirring until the sauce is smooth. Stir in the jalapenos and bacon. In a medium bowl, mix together the panko breadcrumbs, parmesan cheese and butter. Sprinkle the mixture evenly over the macaroni. Bake for 10 minutes or until topping is light brown. Sprinkle with cilantro and serve, garnished with additional bacon and jalapenos if desired. This was amazing and the technique is awesome. Less pots and pans!!! I will use this method (and recipe)again. Thanks! !